134 labyrinths found. Showing 81-100. Sorted by country, state, city, then zip/postal code. The large and open Atrium, showcasing three monumental artworks including Roger Leitner's Chartres Labyrinth is a fascinating part of the grand Atrium and is a re-creation of the 13th century Chartres Cathedral Labyrinth in France. After hours, knock on front door and Security will let you in! Don't trust your GPS look at a map! Designed to help people transform personal and global challenges, this beautiful spiral labyrinth is nestled in a mountain forest next to a creek. 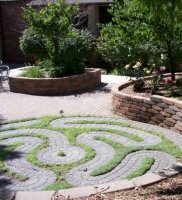 This labyrinth is dedicated to helping people access Wisdom beyond their normal consciousness. As you walk, Life Coach Tamara will hold the space and then help you interpret the information you received and understand how to apply it to your life. Tamara is a professionally trained Life Coach, Art Therapist, and Counselor. The Cosmic Portal Labyrinth Walk is open during spring, summer, and autumn months, by appointment only. The Heart Labyrinth. 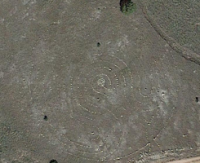 This is the original design for the 40 foot labyrinth that I "tattooed" upon my land in a sheltered grove of native ponderosa pine. The entrance and exit are at the bottom in red. The real thing is spectacular! James Canyon was destroyed in the thousand year flood of 2013. The road is under construction until late fall 2017. Detours and delays are common. Please call if you would like to visit. The weather at 7,000 ft. can change rapidly, so be prepared with the proper attire. 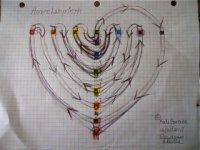 The Heart Labyrinth - inspired by Eurythmy, the expressive movement art originated by Rudolf Steiner and Marie von Sivers. James Canyon was destroyed in the thousand year flood of 2013. The road is under construction until late fall 2017. Detours and delays are common. Jamestown sits at 7,000 ft. in the foothills of the Colorado Rockies. The weather can change rapidly, be prepared. The labyrinth is south of the parking lot, that is to the right as you drive in, look beyond the trees. Modified medieval - it is gently oval shaped with 5 circuits for walking and room at the center for meditation. Dark Granite Stone marks the pathway. Wadsworth Blvd. south to Florida Ave. Florida west (left) to Pierce Street. Pierce Street north (left) to church. Labyrinth is behind the building. Possibly the highest non-denominational labyrinth in the US? Altitude: 9,732 ft. Follow Nature Trail to the top. It's at the far side of the picnic area. Follow the signs in the area. 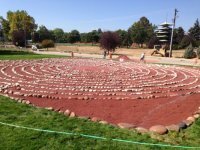 The Labyrinth is located outside, west of the main entrance on Lakeview St. near Caley Ave.
From 470 and S. Santa Fe Dr. head north on S. Santa Fe. Turn Right on W Mineral Ave. Turn left on W. Jackass Hill Rd. which becomes S. Prince St. Turn right on Rangeview Dr. and then left on S. Windermere St. to the Labyrinth at 7000 S. Windermere. From I-25 and S. Santa Fe Dr. head south on S. Santa fe. Turn left on Church Ave. Turn right on Prince St. Turn left on W. Ridge Rd. Turn right on S. Windermere St. to 7000 S. Windermere. Our 8 circuit Labyrinth is located on the east side of the church building. St. Gregory's is just east of St. Frances Cabrini Catholic Church (easy landmark). The labyrinth is outdoors, in the grass, located between the buildings. Enter St. Gregory's parking lot off of Chatfield Ave. (observe no parking area during school year). A 36 foot Chartres style and a 24 foot modified Chartres.